Ok, this is a 1:1 press announcement. But we like the style some teams are naming themselves. So: The red squad "Himoinsa" is once again expected to be the world’s best private team. Five riders make up this powerful squad: Gerard Farrés, Iván Cervantes, Dani Oliveras, Rosa Romero and Marc Solà. A single objective: to improve on the incredible third position achieved by Farrés in the 2017 edition. The team’s ambitions stay intact, as they take on the Rally’s 40th edition with the highest aspirations. The greatest Spanish team in history can be proud of their unrivalled evolution within this race: In barely three years, they have sneaked into the event’s Top 3. Back in 2015, a newborn Himoinsa Team set off on its incredible adventure with Miguel Puertas, Rosa Romero and Antonio Gimeno. One year later, with a renewed structure, the team managed to get all riders across the finish line, placing Gerard Farrés in an amazing 8th place, joined at the finish line by Iván Cervantes, Antonio Gimeno, Dani Oliveras and Rosa Romero. In last year’s 2017 edition, the team shows up in full force, lining up with 6 riders (Antonio Ramos joins the team) and ascending to a third place overall, a historical milestone for a private team fighting against the almighty factory structures. Gerard Farrés himself, third in the previous edition, served up a beverage and chatted friendly alongside his 4 teammates with all the media in attendance: "Last year I made a lifetime dream come true: I finished on the podium in the race I have been dedicated to for all my professional career. What more could I ask for? Well, this year the ambitions are just as big, and we will go for broke as we always do. I have had a tough year due to my knee injury, but I feel in great shape and we have trained more than ever, improved significantly in navigation, and we are overall much better prepared than last year." By his side, Iván Cervantes, strong as ever, shared a laugh with his fellow guests as he commented about his aspirations for this upcoming edition: "I am highly motivated, and we have worked very hard. This year I will race my third Dakar, and I have evolved greatly, I feel very confident after the final preparation in Morocco. This year navigation has been my main focus, and we have clearly developed and improved, because our approach to the training has been correct and the results are starting to show. It will likely be a brutal edition, because one doesn’t celebrate his 40th birthday every day, so we are ready for anything to come." Miguel Puertas, Team Manager, elaborates on the Himoinsa Team’s numbers for this year: "We have grown and evolved into a more complete structure to tackle the race with even better odds than before. 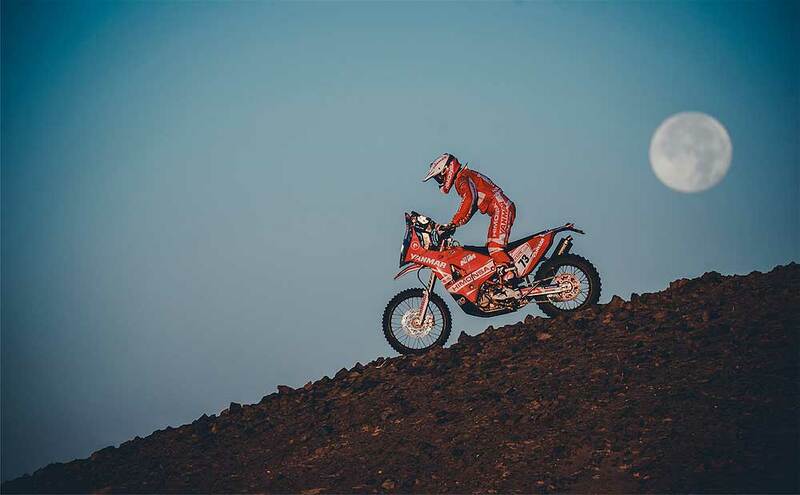 We will have 5 riders on track, 4 KTM 450 Rally and one 450 Enduro Rally Kit for Romero, 1 6×6 truck, 1 4×4 motorhome truck, 1 motorhome, 1 press vehicle and a technical team consisting of 9 people to ensure that nothing goes wrong. We are very well prepared, and, above all, we are a very united team." This season, the team has kept up its fighting spirit and work ethic to, once again, set the sky as the limit. 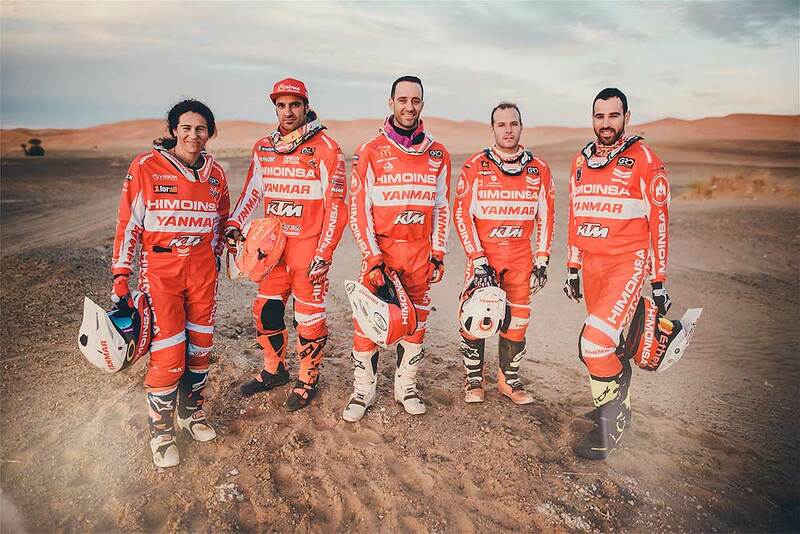 Yet another highlight, Marc Solá joins the team to participate in his third Dakar, after crossing the finish line in his two previous participations: "I am very excited, it has been a fantastic season and I feel right at home in this team. They took me on with open arms and I have adapted well to their working methodology, we are a great family. The KTM is outstanding, I have gained lots of confidence through the racing and testing we have carried out, and I feel very well prepared." Alongside him, Dani Oliveras, one of the most surprising performances from last year, was visibly hopeful with the team’s preparation: "I feel really pleased with the technical development we have reached on the KTMs, we have ridden countless kilometers of testing and the results are already showing. As you can see, we are a very united group and we all get along exceptionally well. This will all translate into our riding, and I am certain that we will complement each other to tackle this race at our full potential." The red squad would not be complete without Rosa Romero, a true role model due to her progression in this race: "This will be my 7th Dakar. I am very happy with my improvements, I have worked very hard and here I am for yet another year, willing to keep fighting towards the finish line in Córdoba and competing in the women’s classification, which is more competitive every year. I am mentally prepared for what will surely be a different and demanding edition, and I have decided to go back to the KTM 450 Enduro because I feel very comfortable on this bike in any kind of terrain." Hosts and media enjoyed a friendly atmosphere to comment the spectacular 40th edition which awaits them. Precisely one year ago, the team leader, Miguel Puertas, predicted the possibility of being within the Top 5. His prediction was correct, and they came back home with a third place. What is in store for them in this 2018 edition?